A modular system, with lots of variable combinations. 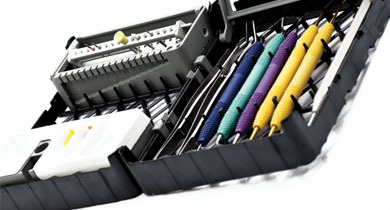 Versatile PractiPal® Tray and components give you the freedom to adapt them to your specific needs. They easily adapt to a variety of functions and uses. All components are designed to function within the system or as stand alone. PractiPal Tray provides effective, safer infection control, cleaning and sterilization. For effective sterilization it is vital that the instruments are thoroughly clean. PractiPal Tray provides a optimal cleaning in a disinfectant washer. This complete set includes 2 trays (black), 1 instrument clamp, 1 Large Bur/File Stand and 1 MultiBlock with 5 ea MultiDappen, MultiPoint, Waste Cup disposables. This compact set includes 1 tray (black), 1 instrument clamp, 1 Small File Holder and 4 disposable Waste Cups. This compact set includes 1 tray (black), 1 instrument clamp, 1 Small Bur Stand and 4 disposable Waste Cups. Trays can be clipped together for larger set-ups. 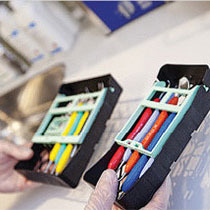 Two clipped trays fit within standard tray and lid dimensions. Tray holds 9 instruments. Holds 28 files or 16 burs. MultiBlock plus 5ea of disposable MultiDappen, MultiPoint, WasteCup and Small Foam. Holds 2 extended burs, 5 HP/RA burs and 8 FG burs.